Nelio A/B Testing Plugin is the most powerful tool for A/B testing your WordPress. It offers you the chance to test several different aspects from your site easily from within WordPress, so there’s no need to learn new complex tools. One of the most important things in A/B testing is the definition of conversion goals. Learn how you can specify them with Nelio A/B Testing! Understand what Conversion Actions are and how Goals help you analyze the results. Corporate Design. He helps his customers define the corporate image for their companies, including the logos, colors, and so on. Digital Image. He helps his customers to move to the digital world, creating website designs that adhere to their already-existing corporate designs. Corporate Design and Website Development. A combination of the two previous ones, where he offers an integral solution to his customers. Bob wants to increase the number of visitors that are interested in his services. In order to do so, he creates an A/B Testing experiment on his Landing Page. He has a few ideas on what to change (colors, headlines, or buttons), but how will he know which alternative versions makes more visitors to be interested in his services? Bob must first define what he considers an “interested visitor” and set this as the goal of the experiment. We have already seen that each package has its own WordPress page, where further details and a contact form are available. Therefore, Bob decides that “a user is interested in (one of) his services if the user goes from his landing page to the package description page”. Let’s see how this can be achieved with Nelio A/B Testing! The idea behind A/B testing is that one wants to increase the number of visitors to his website that perform a certain action. Examples of these actions* may be visiting a certain page or post within WordPress, visiting an external page, submitting a form, reading the whole article, purchasing a certain product, and so on. In our example, Bob wanted to increase the interest his visitors show in his services. In order to measure this interest, he decided that users have to visit one of the pages with the details of his packages (that’s the action). 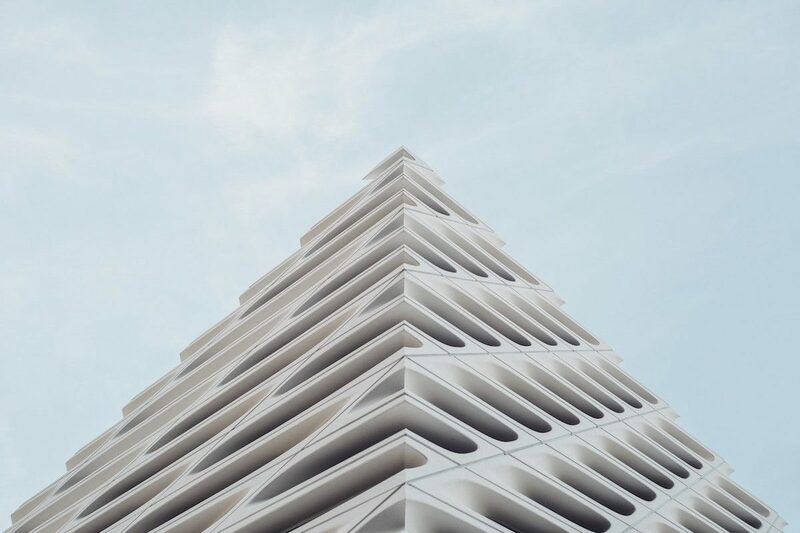 Nelio A/B Testing offers the possibility to evaluate one or more goals, and, for each of them, define the actions that should be taken to fulfill that goal. When the experiment is running (or once it is finished), you can evaluate the performance of each alternative with respect of every single goal. Goal (main goal). Increase interest in any of my products. Action. Visit the WordPress page Corporate Design. Action. Visit the WordPress page Digital Image. Action. Visit the WordPress page Corporate Design and Website Development. Goal. Increase interest in my basic products. Goal. Increase interest in my advanced product. Now Bob has all the information he needs to decide which alternative is better, depending on what he wants to maximize (all kinds of interested visitors or only visitors for specific packages)! Nelio A/B Testing aims to help you increase your conversion rate and, hence, your revenues. Starting at version 3.4, you are now able to define the average benefit that a conversion gets you. Thus, for instance, a user subscribing to your basic plan (and thus fulfilling the Subscribe to our Basic Plan goal) gives you USD29, whereas a user subscribing to your professional plan (which fulfills a different goal) gives you USD89. Have all the relevant information in your WordPress! There’s no longer the need to use additional tools and spreadsheets to get this information. This is one of the most common actions available. In order to add one action of this kind, simply click on the Page icon, available in the New Actions section of each Goal. 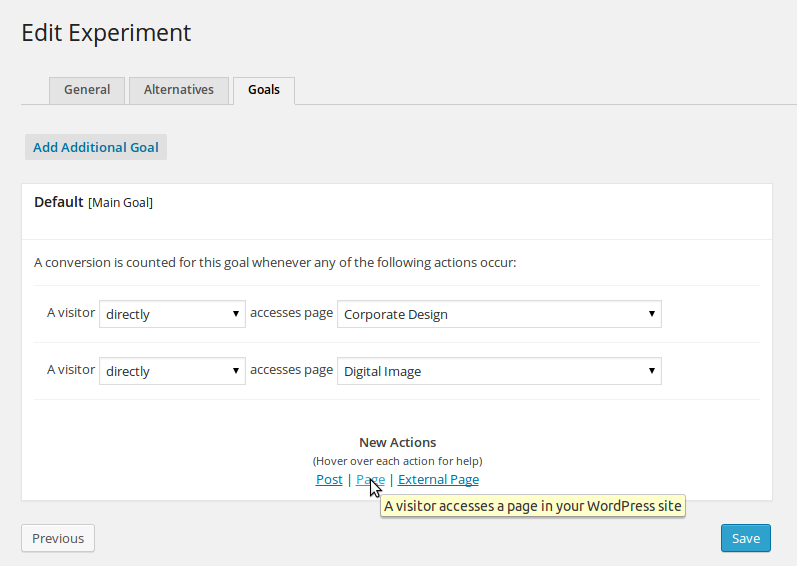 This action counts a conversion when a user accesses the specified page in your WordPress site. Then, just select the Page that has to be accessed by the user to compute a conversion. This is one of the most common actions available. In order to add one action of this kind, simply click on the Post icon, available in the New Actions section of each Goal. 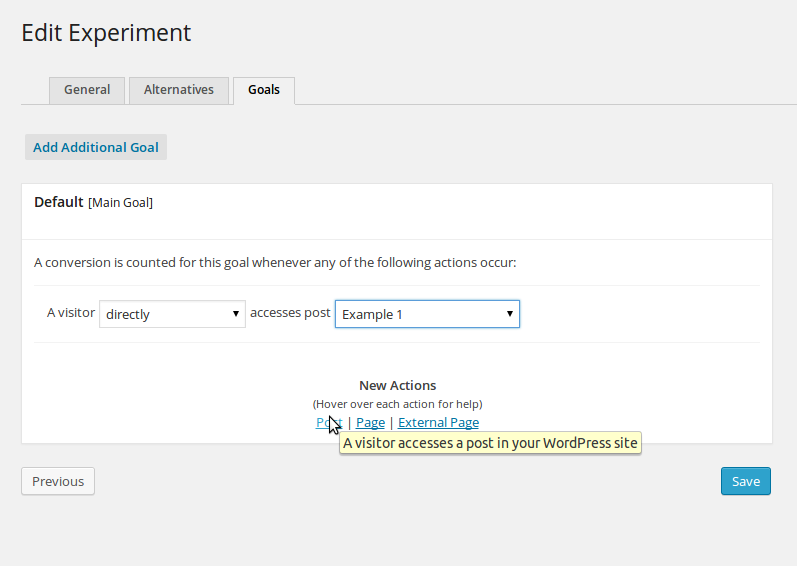 This action counts a conversion when a user accesses the specified post in your WordPress site. Then, just select the Post that has to be accessed by the user to compute a conversion. This is also one of the most common actions available. 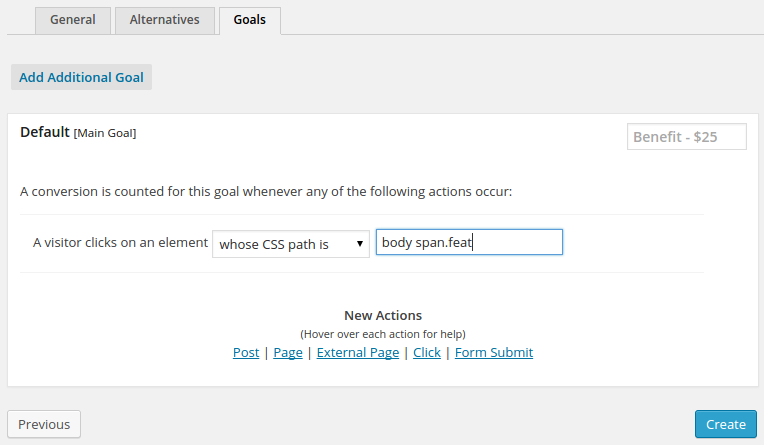 In order to add one action of this kind, simply click on the External Page icon, available in the New Actions section of each Goal. External Pages are essentially identified by its URL. This action counts a conversion when a user is about to leave your page and go to the URL address as the specified in the action. Therefore, this action detects a click on links whose href attribute is the specified URL. The action has two fields. On the one hand, there’s a friendly Name for the goal page you’re interested in. On the other hand, there’s the URL of said page. 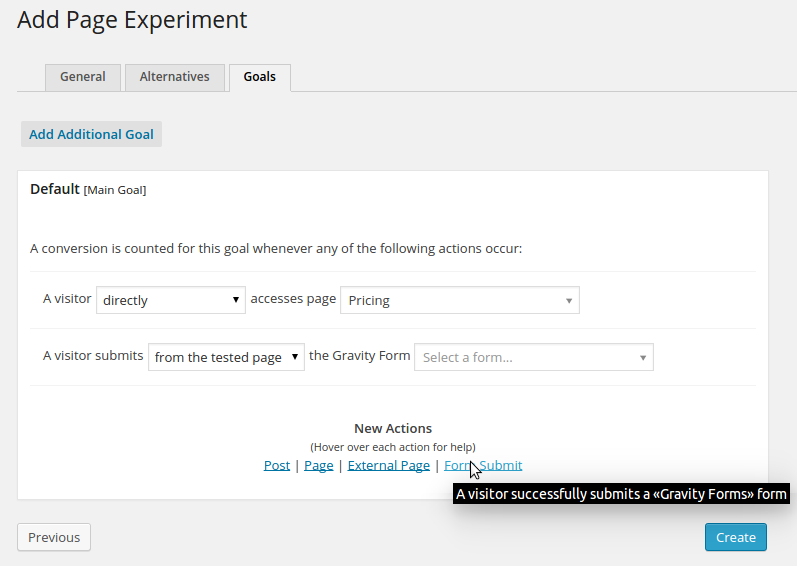 One of the most important conversion actions we want our users to perform is a form submission. Either because we are interested in getting their contact details, to subscribe to our newsletter, or to post content in our site, tracking if users successfully submit a form or not is usually crucial. Nelio A/B Testing is now compatible with two of the most well-known form plugins for WordPress: Contact Form 7 and Gravity Form. If you have any of these plugins installed, you’ll see a new action available in the Goal Definition, named Form Submit*. Click on it to track the submission of a form. When using this conversion action, you simply need to tell our plugin the Form you’re interested in—just click on the dropdown field and select the specific form among all your forms. What if your page relies on AJAX for displaying dynamic content? What if your conversion actions occur on the page itself, without the need of accessing other pages or submitting forms? 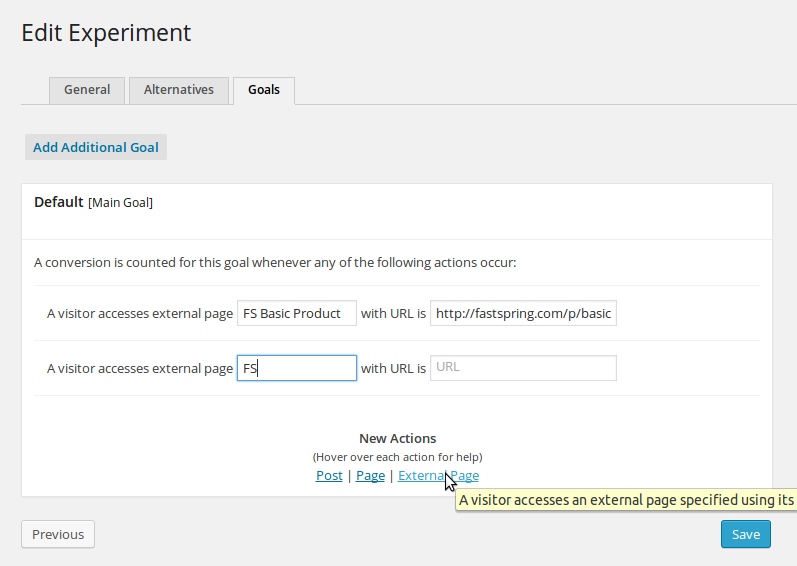 What if you simply want to track your users clicking on a certain element in your page? Nelio A/B Testing can also track Element Clicks. With element clicks, you simply need to define the element(s) that you expect your visitors to click on, and a conversion will automatically be counted whenever they do so! Here’s the required information. There are two settings relevant to Click actions. The first one is Selection Mode, and specifies how elements should be tracked— using their HTML ID, which uses the id attribute of the relevant elements for tracking them, using a CSS Path, a selector such as, for example, body span.feat or #introduction, or looking at the exact Text tracked element should contain. The other section is the Selection Value. Once you selected one of the aforementioned modes, you simply need to specify the specific actual ID, CSS Path, or expected Text to find and track the relevant element. One of the most important goals for e-commerce is to sell more products. Testing several versions of a page to see which one drives more sells is a must for every growth hacker. You want to know how to increase the number of product purchases. Nelio A/B Testing is able to track Product Purchases in WooCommerce too. Regardless of the type of experiment you’re running, Nelio now offers the opportunity to count as a conversion the fact that a certain product has been purchased. When a WooCommerce order is completed, if that order contains that product, Nelio will count that as a conversion. 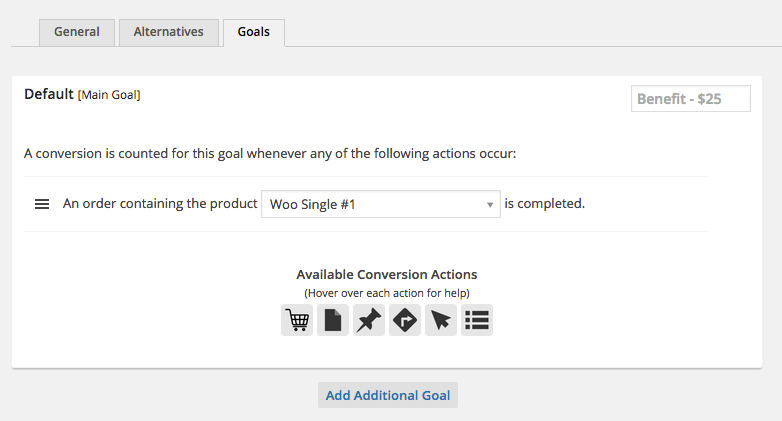 Selecting the relevant WooCommerce product is as simple as finding it in the dropdown selector. Then, whenever that product is included in an order and the order is said to Completed, a conversion will appear in Nelio A/B Testing.